4.5 stars. A delightfully whimsical tale that will delight young readers and adults alike. The plot follows ‘Dad’ who goes out to get the milk and gets way-laid by aliens, disrupts the space/time continuim, takes a balloon ride with a talking stegosaurus, meets pirates and vamipes and Aztecs, and saves the world from remodelling. The story is like ‘Hitchhiker’s Guide to the Galaxy’ for the under 8’s and in 50 pages. There is so much to like about this book. Kids will love the absurdity of it, and the knowing eyeroll they can have at the expense of clueless parents, while adults can laugh at the popular references and humour. The illustrations are exceptional, Chris Riddle seems to have a tap directly into Gaiman’s brain! The only criticism I have is that in a couple of places the time travel elements were a little tricky to understand. Fine for kids who are happy to roll with a story, but not so much for the ones who want to know ‘why’ on every page. But it is definitely one of those books kids will enjoy reading over and over. I adored this book and am so glad I bought it for my little cousin for Christmas. Start them young on Gaiman I say! Great review! I love Gaiman so much! I’ll need to read this soon. I wish it was published in Spanish, to spread the love too. At least there’s now a translation of Neverwhere, and I can at last give a book to my friends I’ve talked so much about! 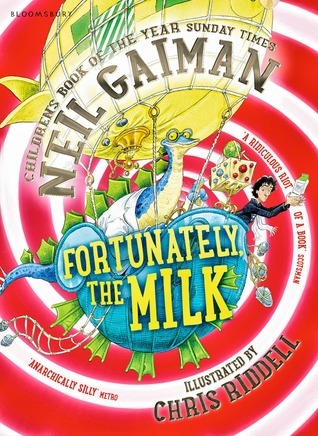 Many of Gaiman’s works are translated, but Fortunately, the Milk was only published a year and a half ago so I wouldn’t be surprised if there’s a translation on the horizon! I’m so glad you enjoyed Neverwhere, it’s one of my all time favourites 🙂 Thanks for stopping by!